Chinese Festive music is characterized by a joyful spirit and a large-scale instrumental ensemble. 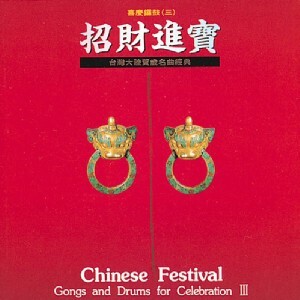 This album, Chinese Festival, contains nine famous pieces of cheerful festive music popular in Taiwan and the Chinese mainland. It was completed through the cooperation of the Chinese Music Conservatory's Folk Music Ensemble and other master musicians of Chinese gong and drum music. Every note of music seems to deliver to the world the message of joy of the coming of spring.